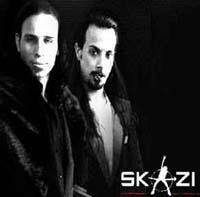 DJ Skazi was formed in 1998 which made them relatively new in DJing. But the background of each member of the group is nothing short of impressive. Asher was part of Jerusalem-based punk bands "Sartan Hashad" and Rock Ba-Yarok. His stint in these punk groups lasted seven and three years, respectively. Assaf B-Bass on the other hand was already part of the trance music since the early 90s. Assaf B-bass is known to be part of the group Mental Orange that lasted for three years. The difference in musical backgrounds did not cause any friction between the two but instead created a very unique harmony rarely heard in trance music. Assaf B-bass uses his synch to produce the familiar trance music while Asher worked on his riffs to provide the aggressive unique sound. Their unique collaboration led to the release of the album "Animal Storm" in 1998 which took the duo Seven Months to complete. The response to the initial album was very impressive. After the success of the first album, DJ Skazi released Zoo, Zoo 1, Zoo 2 and Zoo 3. Since the success of their initial album, DJ Skazi became a sought after act in various countries around the world.